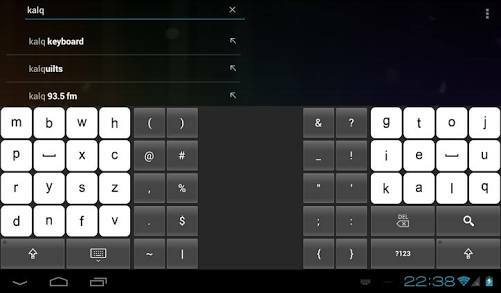 The highest rated third party keyboard app in Google Play Store. Available for free, will be a good default keyboard replacement. 70+ colors, designs and themes. 150+ languages bilingual auto correction. GBoard or the Google Keyboard was available in the Play Store just recently. And, it has now become the favorite keyboard among Droid users. Available for iOS devices long back and the stock keyboard of Pixel phones. Glide Typing – Type faster by sliding your finger from letter to letter. Voice typing – Type using your voice. GIFs – Search and share GIFs. Multilingual typing – Switching between languages with ease. Google Translate – Translate as you type. If you are a linguist and plays with different languages especially Indian. Then the below keyboard serves you best. Supporting 10+ Indian languages and with enough features. Google Indic Keyboard destroys all the language barriers. Native keyboard mode – Type directly in native script. Handwriting mode (currently available for Hindi only) – Write directly on your phone screen. Hinglish mode – If you choose “Hindi” as an input language, the English keyboard will suggest both English and Hinglish terms. ‘Qwerty’ is the modern keyboard layout we use in PC’s, Laptops, Smartphones etc. Even, around two decades after the invention of ‘Qwerty’. No new keyboard layout was powerful to outperform Qwerty. But, it looks Kalq Keyboard may be the kaal of Qwerty. Let us look what exactly is the Kalq!! Invented by some of the researchers of Max Planck Institute of Informatics, Montana Tech and University of St. Andrews, is destined to take over the Qwerty legacy. Being, the world’s first new and smart Thumb based keyboard for touch screen devices. The developer of Kalq claims that the Kalq provides more than 30% higher performance and accuracy than Qwerty. The app is now available as beta in the Play store. Whether it can replace Qwerty from our keyboard is a matter to be looked upon. Above provided keyboard apps are listed as Best based on our research and thoughts. If you may find other keyboard apps apt in the above list, do let us know.